If you love chocolate milk, you’re in luck. This “milk” is dairy-free and naturally sweetened with fruit, making it a guilt-free treat that you can enjoy anytime. It comes from the book, 100 Best Smoothies, Juices, and Healthy Snacks: Easy Recipes For Natural Energy & Weight Control the Healthy Way, by Emily von Euw. Emily’s the blogger behind This Rawsome Vegan Life, which features decadent (yet healthy) raw food treats that are as pretty as they are tasty! Her latest book features an abundance of recipes for delicious juices, smoothies, and healthy snacks, that are all easy to prepare and made with whole food ingredients. 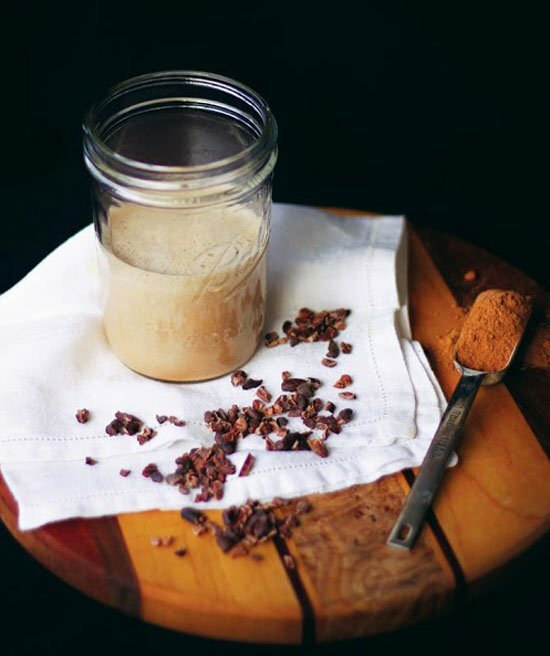 I’m drooling over her raw food treats, like Cocoa Oat Bars with Peanut Butter and Carob and Dark Chocolate Chip, Oat & Hemp Cookies, which would go perfectly with a cold glass of this Chocolate Mylk recipe below. Thanks to Emily for letting me share it with you all! A creamy chocolate drink that is dairy-free and naturally sweetened with fruit! Disclosure: Emily sent me a complimentary copy of her book and I wanted to share these easy and healthy recipes with you all! A on the go protein bar. A recipe for a healthy snack bar, like a granola bar would be great. Would love to see a healthy casserole! Tough to find ones without cream of ____ soup. A quick and easy dinner!! Something to get in more greens! Or a vegan and grain free scone made with coconut flour. I think using coconut flour without eggs is the hardest thing! I’d love to see an easy curry dinner. ty! I would love to see more soup recipes and anything that is chocolate that is actually good for me! Ohsheglows.com has an amazing vegan chili. My meat/potato husband didn’t even realize it was missing beef and he absolutely loved it! . I made it twice in the last 2 weeks! I would love to see a smoothie recipe that uses 4 – 5 vegetables, since I usually only put in spinach and kale – other options would be great! As a student, I am always looking for easy recipes that are good to pack and carry. I would love more easy and healthy lunch recipes. I second this one! As a college student, I struggle with healthy (and easy) breakfast and lunch recipes that can be eaten on-the-go/ in a pinch. I would love to see a recipe with a resistant starch (preferably not with beans). I have been told I need more in my diet but am struggling with how to incorporate them! You already have so many delicious recipes on your site. I like the recipes that appeal to kids. As an adult I will eat most anything if it is good for me and doesn’t taste completely awful, but my kids are a different story. They eat healthfully, but I need to get more veggies in them. And I’d like to do it without tricking them or disguising the veggies. Maybe more recipes on how to get more veggies in them at breakfast and lunch rather than just at dinner. I would love to see some coconut-free dessert recipes. I know a number of folks with coconut intolerance, including myself, and its getting more difficult to find delicious, sugar-free dessert recipes that are also coconut-free. Cheers! I would love to see more easy dinner options for my family. I keep trying to sneak more veggies in!! I am at a loss and I would love to see a recipe for breakfast that doesn’t use eggs, nuts, dairy or whole grains. Thank goodness for YOU and your amazing creative recipes. My daughter has so many food allergies and your work enables her to enjoy food that she loves. Your coconut Blondies ate her favorite cookie and take-a-long snack on the go! Could you develop the recipe with cacao and “chocolatize” the tecipe? 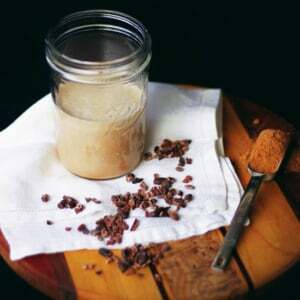 What could be more yummy than “cacao-almond-coconut”? Love, love, love your blog! THANK YOU for giving us delicious, alternative choices in life! ❤️ -Tammy U. Something gluten free and egg free for breakfast – that’s the toughest meal of the day for me. Especially something that my kids would like – no fun having to fix something for me and something different for them! How about some healthy casserole recipes? I would love to see a recipe for a casserole or a dessert, but anything you come up with is delicious. I have been following the winter detox and the food is amazing! I would love to see some smoothie recipes!! I would love to see a great fudgy brownie recipe that is also healthy. I would like to see a sugar-free honey substitute. Broccoli casserole. Is that even possible? I’d love to find out. Thanks for this new recipe and the chance for the book! I’d love to see a recipe for healthy one pot casserole dish! I’ve been on a search lately for a simple granola bar. Your Raspberry Almond ones are great, but I’d like to find one that’s really simple for those in-a-rush times too! And something not too heavily nutty. Ohh – this is my kind of “mylk”!!! I would love to see “Hippie Hemp Hummus” maybe? I would love a new salad dressing! I would really love to see more sugar/sweetener free desserts!! I really have a hard time avoiding sugars. I would love to see more dairy free recipe with or without substitutions. Thanks for all you do. Yum, this looks awesome! The next recipe I would like to see is for savory snacks that are tree-nut free! A soup – potato leek maybe? Something good and creamy without the cream! I totally agree! I tried the cauliflower soup from The Pioneer Woman and although my family loved it….the cheese….the cream. We are packing on the pounds here. I know cauliflower is the unsung hero of the veggie world and I’d love an option that didn’t inflate me too much. Potato soup, broccoli soup, all are soo good but the calories. The fat. I’ve gotta stop. I would love to see a quick grain free casserole I can make for a bunch of people. My kids are on a cornbread kick and my youngest can’t have eggs so I’d love to see your take on vegan cornbread. I’d like to see a healthy, no sweet breakfast. I had a food processor for Christmas so now I can make so many of your recipes that I couldn’t make before that I don’t really need a new one. But if I had to say something, I would like to see a recipe with gelatin. Thank you for sharing! I would love to see healthy vegan butter tarts! Would love to see a nut free double chocolate chip cookie recipe. Thank you! looks tasty! Would love To see another toddler recipe next time. Thank you! The healthy recipe I would love to see next is for healthy Blondies. Detoxinista does have a recipe for flourless blondies on her website. I’d love a savory snack that does not have bell peppers in it. I also have a new Vitamix and would love some recipes for smoothies so this book would be wonderful. Thank you for your healthy recipes! Also, it was difficult to find the comment button on my smartphone even in desktop view, so I pressed reply to an already posted comment. I hope I am still in the running for the giveaway!